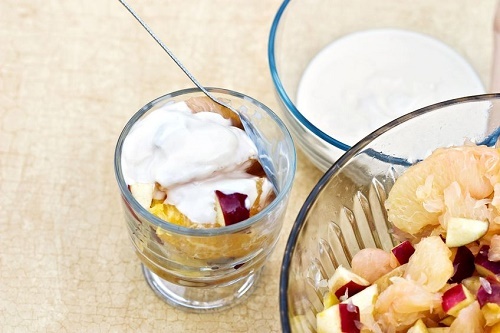 Here’s another summer fruit salad that will tickle your taste buds. Whisk creamy ingredients like mayonnaise and yogurt in a small bowl. Add honey, lemon juice, salt and vanilla extract to the mixture and combine with mangoes, seedless grapes, apples, strawberries, and chopped walnuts.